Organize, edit, create, share your pictures easily. BlazePhoto, a powerful and complete digital photo utility, integrates photo importing, previewing, organizing, editing, creating and sharing. Compliant with multiple locations, BlazePhoto allows you to import digital photo from hard disc folder, CD/DVD disc, DC/DV, PC Cam or any other removable devices; lets you flexibly classify, view and edit image. There are also multiple sharing choices available for you to choose, you can print, email, burn CD, create slideshow DVD and create html album. BlazePhoto provides an ideal solution for your lifetime of memories organizing and enjoying, brings you an exciting and easy way to share your memories with anyone, at any time and anywhere. 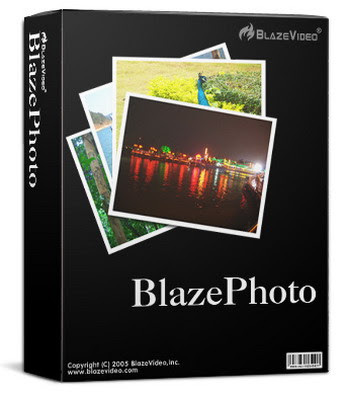 BlazePhoto supports most popular image formats: such as JPG, BMP, TIF, GIF, PNG, WMF, EMF, etc. BlazePhoto also supports EXIF2.1, for those edited or converted JPG, TIF, their EXIF info will not lose. • Import Photos: BlazePhoto supports multiple image locations, can import image from hard disk folder, CD/DVD disc, DC/DV, PC Cam or any other removable devices; BlazePhoto can real-timely capture and save image from PC Cam, transfer image between DC and hard disk folder; BlazePhoto also allows you to freely search for your desired image. • Organize Photos: BlazePhoto sorts image by people, place and events tags, and you can also create your own favorite tags. • Preview Photos: Provided with multiple image preview modes: get photo from disk, from history record or from catolog; supports Single Picture, Big Thumbnail, Small thumbnail, Preview_Thumbnail view modes, you can also view full screen image and image slide show. • Edit Photos: Easily edit image, provided with multiple popular edit functions, such as rotate, crop, flip, resize, etc. Supports enhance function: remove red eye, adjust color, blur/sharp, auto enhance; supports creating function: add text, add clip, add frame, add filter such as Mosiac, Windy, Motion, Gray, Emboss, etc. • Create: Create single or multiple images into html album, burn to CD disc or create slideshow DVD. • Share Photos: Print single or multiple images, send email, batch resize, rename and change image format.